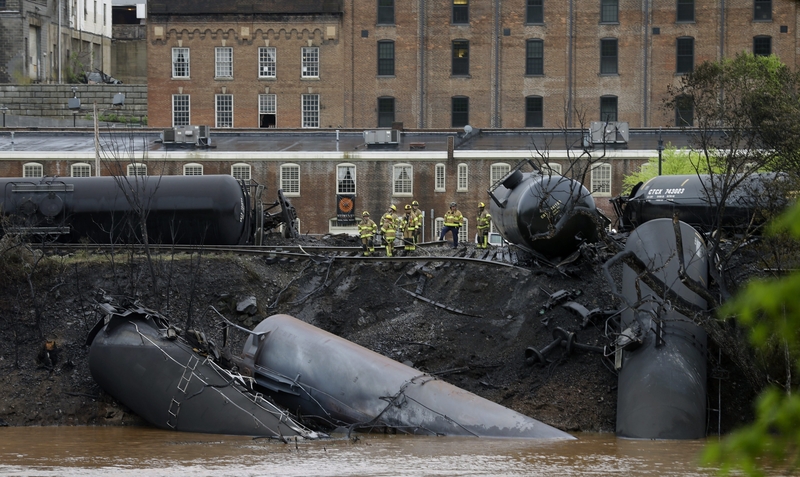 Rescue crews work along the tracks where several CSX tanker cars carrying crude oil derailed and caught fireWednesday near Lynchburg, Va.
WASHINGTON – A train carrying crude oil derailed and caught fire in downtown Lynchburg, Va., on Wednesday, just as Gov. Andrew M. Cuomo and Sen. Charles E. Schumer were stepping up their warnings about the dangers such “oil trains” could pose in New York state. Several hundred Lynchburg residents were evacuated but no one was injured in the incident, the city of 77,000 reported on its website. Video of the derailment posted to YouTube showed three rail cars in flames and huge clouds of black smoke billowing into the sky. “This is the latest in a series of accidents involving trains transporting crude oil, a startling pattern that underscores the need for action,” said Cuomo, who, earlier in the day, wrote to President Obama, asking that the federal government bar the shipment of oil in outdated, accident-prone tanker cars. Two or three such trains roll through Buffalo every day carrying either crude oil or ethanol, and one of them derailed last December without prompting the sort of fire that occurred in Lynchburg on Thursday. The Cheektowaga incident was just one of several that have prompted Cuomo and Schumer to criticize the burgeoning business of shipping oil in outdated, unpressurized tank cars. Most notably, 47 people died last July when an oil train derailed and exploded in Lac-Megantic, Quebec, destroying half of the city’s downtown area. Thursday’s accident in Lynchburg was not nearly that catastrophic. The train was traveling from Chicago to Virginia when about 15 of its cars derailed at about 2:30 p.m., the railroad reported. Photographs from the scene showed that in addition to the three cars that caught fire, three more fell into the James River, which supplies the City of Lynchburg its drinking water. The city said on its Twitter feed, though, that drinking water supplies had not been affected by the accident. A witness to the accident, Mason Basten, told the Lynchburg News & Advance that the train was moving at about 20 mph before it stopped. About 10 seconds later, he heard a roar and saw the explosion. Before long, “the whole riverbank and the whole riverbed was on fire,” Basten told the local newspaper. Fearing that such a scene could occur in New York State, Cuomo on Thursday asked Obama to issue regulations barring the shipment of oil in outdated DOT-111 rail cars, which are neither armored nor pressurized, meaning they are much more likely to puncture or explode in a derailment. “These trains travel through populated communities in upstate New York, and we cannot wait for a tragic disaster in our state to act,” Cuomo said after the Lynchburg accident. In addition, Cuomo issued a comprehensive report on the issue Wednesday, requesting that the federal government and industry take several additional safety measures. Cuomo also announced that the state is moving forward with a host of its own reforms, including increased rail inspections and regulations requiring more complete disclosure on the volume and characteristics of the oil being shipped through the state. The volume of those shipments has skyrocketed in recent years, due to the Bakken Shale oil boom in North Dakota, which has prompted the oil industry to ship its products to the East and South via rail. In February, Schumer said those DOT-111 rail cars should not be allowed to carry oil through densely populated New York State, and on Wednesday he urged the U.S. Department of Transportation to issue a rule forcing rail companies to disclose the hazardous materials they are shipping in those cars so that local first responders and emergency personnel know the dangers they may be facing. Schumer said he hopes the DOT will address that issue in a larger rule it is developing setting new safety standards for rail tank cars. Transportation Secretary Anthony Foxx has said he will send that proposal to the White House this week, but it’s likely to be months before it’s finalized and made public. Deborah Hersman, the outgoing chairwoman of the NTSB, highlighted the dangers the oil shipments pose during her last week in office, holding a forum on the issue and addressing it at the National Press Club.